This page is about the Piegan. For other Blackfoot/Blackfeet tribes, see Blackfoot (disambiguation). For the former Franco-Algerian population, see Pied-Noir. The Piegan (also known as the Pikuni, Pikani, and Piikáni) are one of the three original tribes of the Blackfoot Confederacy (a "tribe" here refers to an ethnic or cultural group with a shared name and identity). The Piegan are closely related to the Kainai Nation (also known as the "Blood Tribe"), and the Siksika Nation (also called the "Blackfoot Nation"); together they are sometimes collectively referred to as "the Blackfoot" or "the Blackfoot Confederacy". 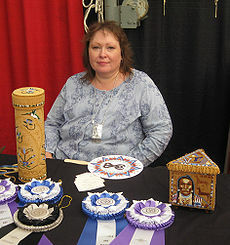 Ethnographic literature most commonly uses "Blackfoot people", and Canadian Blackfoot people use the singular Blackfoot. The tribal governments and the US government use the term "Blackfeet", as in Blackfeet Nation, as used on their official tribe website. The term Siksika, derived from Siksikáíkoan (a Blackfoot person), may also be used as self-identification. In English, an individual may say, "I am Blackfoot" or "I am a member of the Blackfeet tribe." Traditionally, Plains peoples were divided into "bands": groups of families who migrated together for hunting and defence. The bands of the Piegan, as given by Grinnell, are : Ahahpitape, Ahkaiyikokakiniks, Kiyis, Sikutsipmaiks, Sikopoksimaiks, Tsiniksistsoyiks, Kutaiimiks, Ipoksimaiks, Silkokitsimiks, Nitawyiks, Apikaiviks, Miahwahpitsiks, Nitakoskitsipupiks, Nitikskiks, Inuksiks, Miawkinaiyiks, Esksinaitupiks, Inuksikahkopwaiks, Kahmitaiks, Kutaisotsiman, Nitotsiksisstaniks, Motwainaiks, Mokumiks, and Motahtosiks. Hayden gives also Susksoyiks. In 2014, researchers reported on their sequencing of the DNA of a 12,500+-year-old infant skeleton in west-central Montana, found in close association with several Clovis culture artifacts. It showed strong affinities with all existing Native American populations. There is preliminary evidence of human habitation in north central Montana that may date as far back as 5000 years. There was evidence that the people had made substantial use of buffalo jumps from as early as AD 300. The Piegan people may be more recent arrivals in the area, as there is strong evidence that their Algonquian-speaking ancestors migrated southwest from what today is Saskatchewan beginning about 1730. Before that, they may have lived further east, as many Algonquian-speaking peoples have historically lived along the Atlantic Coast, and others around the Great Lakes. Linguistic studies of the Blackfoot language in comparison to others in the Algonquian-language family indicate that the Blackfoot had long lived in an area west of the Great Lakes. Like others in this language family, the Blackfoot language is agglutinative. The people practiced some agriculture and were partly nomadic. They moved westward after they adopted use of horses and guns, which gave them a larger range for bison hunting. They became part of the Plains Indians cultures in the early 19th century. According to tribal oral histories, humans lived near the Rocky Mountain Front for thousands of years before European contact. The Blackfoot creation story is set near Glacier National Park in an area now known as the Badger-Two Medicine. The introduction of the horse is placed at about 1730, when raids by the Shoshoni prompted the Piegan to obtain horses from the Kutenai, Salish and Nez Perce. Early accounts of contact with European-descended people date to the late eighteenth century. The fur trader James Gaddy and the Hudson's Bay Company explorer David Thompson, the first Whites recorded as seeing Bow River, camped with a group of Piegan during the 1787-1788 winter. In 1900, there were an estimated 20,000 Blackfoot. In the early 21st century, there are more than 35,000. The population was at times dramatically lower when the Blackfeet people suffered declines due to infectious disease epidemics. They had no natural immunity to Eurasian diseases, and the 1837 smallpox epidemic on the Plains killed 6,000 Blackfeet, as well as thousands more in other tribes. The Blackfoot also suffered from starvation because of disruption of food supplies and war. When the last buffalo hunt failed in 1882, that year became known as the starvation year. The Blackfeet had controlled large portions of Alberta and Montana. Today the Blackfeet Reservation in Montana is the size of Delaware, and the three Blackfoot reserves in Alberta have a much smaller area. The Blackfeet hold belief "in a sacred force that permeates all things, represented symbolically by the sun whose light sustains all things." The Blackfoot do not have well documented male Two-Spirits, but they do have "manly-hearted women". These were recorded as acting in many of the social roles of men. This includes a willingness to sing alone, usually considered "immodest", and using a men's singing style. In 1858 the Piegan in the United States were estimated to number 3,700. Three years later, Hayden estimated the population at 2,520. In 1906 there were 2,072 under the Blackfeet Agency in Montana, and 493 under the Piegan band in Alberta, Canada. In the 2010 census, 105,304 people identified as Piegan Blackfeet, 27,279 of them full-blooded, the remainder self-identified as being of more than one race or, in some cases, with ancestry from more than one tribe, but they primarily identified as Blackfeet. For histories after the 1870s see the 'Blackfeet Nation' in the US or the 'Piikani Nation' in Canada. Stephen Graham Jones (1972- ), author, won a National Endowment for the Arts Fellowship and the Independent Publisher Book Award for Multicultural Fiction, and other awards. At public readings he has said that his short story "Bestiary" is not fiction. James Welch (1940–2003), author and poet. While most of his published works were novels, he also wrote the non-fiction historical account, Killing Custer: The Battle of Little Bighorn and the Fate of the Plains Indians. He was one of the participants in the PBS American Experience documentary, Last Stand at Little Bighorn. His award-winning novel Fools Crow is based on the Blackfeet tribe and its culture. James Willard Schultz, or Apikuni (1859–1947), author, explorer, Glacier National Park guide, fur trader and historian of the Blackfeet Indians. He wrote and published 37 fiction and non-fiction books dealing with the Blackfeet, Kootenai, and Flathead Indians. His works received critical literary acclaim. ^ a b Nettl, Bruno (1989). Blackfoot musical thought: comparative perspectives. Kent State University Press. ISBN 978-0-87338-370-7. ^ Swanton, John R. (1952). The Indian Tribes of North America. Genealogical Publishing Com. p. 396. ISBN 978-0-8063-1730-4. ^ "Buffalo Jump Expansion Unearths Gems", Great Falls Tribune. 27 March 2011, Accessed 2011-05-12. ^ "Montana Indians" Their History and Location" (PDF). Montana Office of Public Instruction. Archived from the original (PDF) on 2014-04-29. ^ "EARLY BLACKFOOT HISTORY". American Anthropologist. A5: 153–164. April 1892. doi:10.1525/aa.1892.5.2.02a00050. ^ Armtsrong, Christopher; Evenden, Matthew; Nelles, H. V. (2009). The River Returns: An Environmental History of the Bow. Montreal: McGill UP. p. 3. 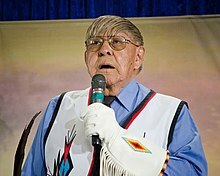 ^ "Earl Old Person inducted into Montana Indian Hall of Fame". Golden Triangle News. Retrieved 2016-04-29. ^ Hanna, Warren L. (1988). "James Willard Schultz-The Pikuni Storyteller". Stars over Montana-Men Who Made Glacier National Park History. West Glacier, MT: Glacier Natural History Association. pp. 95–111. ISBN 9780091679064. Magee Photograph Collection - nearly 1,000 digitized photographic negatives depicting life on the Blackfeet Nation.